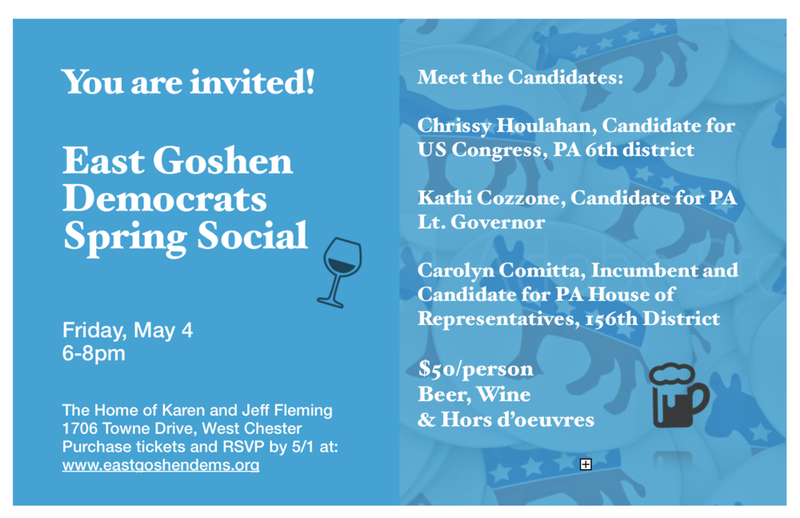 East Goshen Democrats Spring Social - Join Us! We are thrilled to invite you to our Spring Social of 2018! Come meet your Candidates, mingle and get to know your fellow local Democrats. The funds we raise will be used to support democratic candidates and elections in East Goshen. Advanced ticket sales are sold out! Thank you so much for your overwhelming response. We are looking forward to a great evening and a strong year. Ticket sales are still available at the door for $60.00 paid ONLY BY CHECK. Many Silent Auction items will be available so bring your checkbook if you want to participate. If you can't attend, but would still like to donate please visit us here.